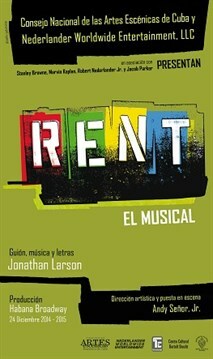 Robert Nederlander, Jr. and Nederlander Worldwide Entertainment (NWE) (www.NederlanderWorld.com) announced today a new production of RENT to be mounted in Havana, Cuba. The production will open December 24, 2014 at the Bertolt Brecht Theatre in Havana for a planned three-month run. This Spanish language production is being produced in partnership with the Cuban National Council of Performing Arts, and will be the first Broadway musical with a full cast, musicians and first-class production elements produced in the nation of Cuba in over 50 years. The new production is part of Nederlander Worldwide Entertainment's ongoing mission to bring Broadway musicals to new and emerging markets around the globe. Following the popular success of the Nederlander Worldwide production of Broadway Ambassadors-a concert featuring Norm Lewis, Capathia Jenkins, Rob Evan and Luba Mason performing classics from the Broadway songbook-at the Havana Theatre Festival in 2011, NWE was invited by the Cuban Ministry of Culture to present an authentic Broadway musical to Cuban audiences, featuring aspiring Cuban actors and musicians. The production joins leading Broadway creative team members with their Cuban counterparts and is a true collaboration and cultural exchange between the Broadway and Cuban cultural communities. The Broadway creative team is led by Andy Señor, Jr., who will direct a company of 15 Cuban actors. Mr. Señor, a leading member of Broadway's Cuban American community, has a long RENT pedigree, first starring as "Angel" in RENT on Broadway and later as a protégé of original RENT director Michael Greif, including assistant directing the Off-Broadway production, and later directing productions of RENT in multiple markets around the world. The Havana, Cuba production of RENT will also feature choreography by Marcus Paul James (who appeared in RENT on Broadway including the 2008 final performance film; Motown: The Musical) based on original Broadway choreography by Marlies Yearby, musical direction by Emmanuel Schvartzman (On Your Feet), sound design by Michael Catalan, and costume design by Angela Wendt (RENT original production). Thom Schilling is production manager. Gisela Gonzalez, president of the Cuban National Council of Performing Arts, said: "This production will be a paramount step for musical theater in Cuba. We will have the possibility of combining Cuban talent with the long time history of Broadway as a form of art. This collaboration in the field of theater will bring us together and we hope that we are going to come up with an authentic and high quality product that leads us into future joint projects." Said Robert Nederlander, Jr., "For over 102 years, the Nederlander family has been a leader and innovator in the Broadway and live performance industry in the United States and around the world. It has been a great pleasure to work with the Cuban National Council of Performing Arts and their extremely talented artists, musicians and technicians in Havana. We are honored to serve as a bridge between the Cuban cultural and Broadway communities and to bring the best of Broadway to Cuban audiences." Director Andy Señor, Jr. made his professional debut in the Tony Award winning musical RENT as "Angel," playing the role on Broadway, London's West End, and US National and International Tours. Later he became the Assistant Director to Michael Greif on the RENT revival Off Broadway, and went on to re-stage the production in Tokyo, Japan. He holds a BFA in Theatre from Florida International University and further trained at the Public Theatre Shakespeare LAB where he appeared in All's Well That Ends Well at the PUBLIC Theatre. Recently, he worked with Jeffrey Seller as assistant director on the new musical FLY at Dallas Theatre Center and is currently Associate Director to Jerry Mitchell on the Broadway musical, On Your Feet. He is the Artistic Director of the District Stage Company in Miami. Nederlander Worldwide Entertainment, LLC, founded and managed by Robert Nederlander, Jr., a third generation member of the Nederlander entertainment family, manages theatres and presents Broadway productions in emerging international markets, produces international productions for Broadway and elsewhere around the world, and undertakes cultural educational initiatives. NWE's expertise covers the gamut of theatre management and operations, along with all facets of live entertainment, including ticketing, management, promotion, marketing, and advertising. In November 2011, Mr. Nederlander presented Broadway Ambassadors in Havana as part of the 14th Annual Havana Theatre Festival, the first Broadway style presentation from the United States to take place in Cuba in over 50 years.